I have wanted to get a red lipstick for quite a while now and I decided to try to find a red in Rimmel's Kate Moss lipstick collection. There were two reds that I liked, a bright one and a darker red. I ended up buying the darker red lipstick as I thought it would suite my complexion better. 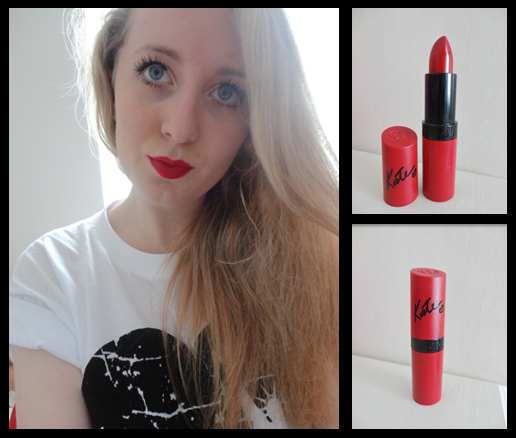 I absolutely love the Kiss of Life (111) shade of Rimmel's Kate Moss Matte Lipstick and am very happy with it. I think the darkness of the shade makes my eyes look very blue and looks better than the bright red would have been with my very pale skin. It also stays on for quite a while and does not fade out quickly like some other lipsticks do. I think the Kate Moss range for Rimmel is fantastic and I like how there is a good variety of different colour lipsticks to try to suit everyone.